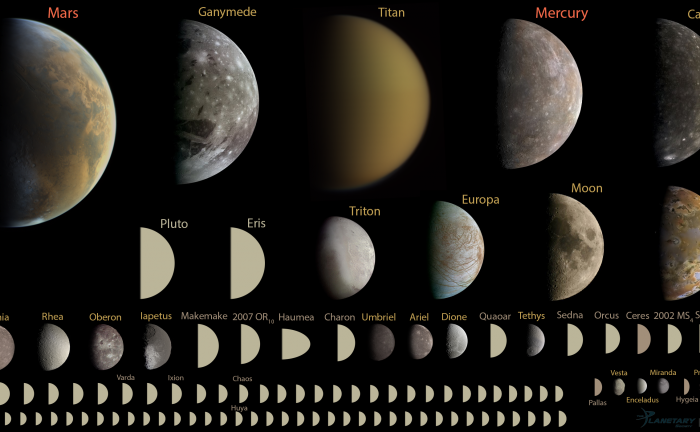 Montage of every round object in the solar system under 10,000 kilometers in diameter, to scale. Credit: Emily Lakdawalla/data from NASA /JPL/JHUAPL/SwRI/SSI/UCLA/MPS/DLR/IDA/Gordan Ugarkovic/Ted Stryk, Bjorn Jonsson/Roman Tkachenko. In 2006, during their 26th General Assembly, the International Astronomical Union (IAU) adopted a formal definition of the term "planet". This was done in the hopes of dispelling ambiguity over which bodies should be designated as "planets", an issue that had plagued astronomers ever since they discovered objects beyond the orbit of Neptune that were comparable in size to Pluto. Needless to say, the definition they adopted resulted in fair degree of controversy from the astronomical community. For this reason, a team of planetary scientists – which includes famed "Pluto defender" Alan Stern – have come together to propose a new meaning for the term "planet". Based on their geophysical definition, the term would apply to over 100 bodies in the solar system, including the moon itself. "(1) A "planet" is a celestial body that (a) is in orbit around the sun, (b) has sufficient mass for its self-gravity to overcome rigid body forces so that it assumes a hydrostatic equilibrium (nearly round) shape, and (c) has cleared the neighbourhood around its orbit. (3) All other objects , except satellites, orbiting the sun shall be referred to collectively as "small solar-system bodies"
Because of these qualifiers, Pluto was no longer considered a planet, and became known alternately as a "dwarf planet", Plutiod, Plutino, Trans-Neptunian Object (TNO), or Kuiper Belt Object (KBO). 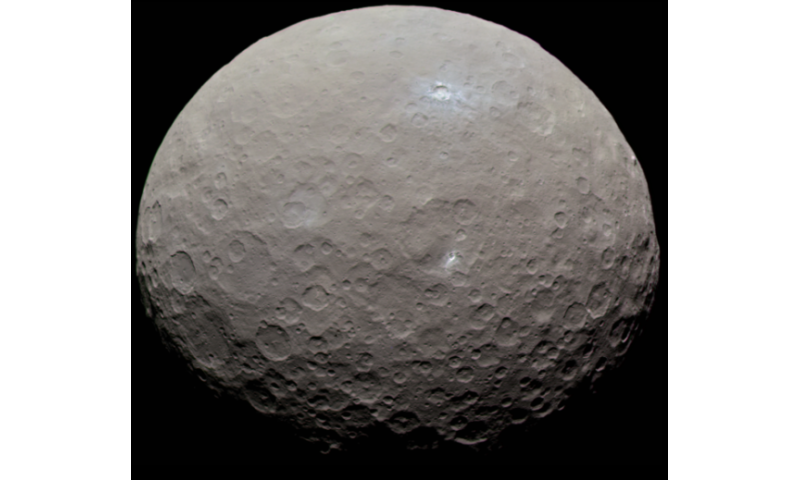 In addition, bodies like Ceres, and newly discovered TNOs like Eris, Haumea, Makemake and the like, were also designated as "dwarf planets". Naturally, this definition did not sit right with some, not the least of which are planetary geologists. Their study – titled "A Geophysical Planet Definition", which was recently made available on the Universities Space Research Association (USRA) website – addresses what the team sees as a need for a new definition that takes into account a planet's geophysical properties. In other words, they believe a planet should be so-designated based on its intrinsic properties, rather than its orbital or extrinsic properties. "A planet is a sub-stellar mass body that has never undergone nuclear fusion and that has sufficient self-gravitation to assume a spheroidal shape adequately described by a triaxial ellipsoid regardless of its orbital parameters." "The IAU definition is useful to planetary astronomers concerned with the orbital properties of bodies in the solar system, and may capture the essence of what a 'planet' is to them. The definition is not useful to planetary geologists. I study landscapes and how landscapes evolve. It also kind of irked me that the IAU took upon itself to define something that geologists use too. "The way our brain has evolved, we make sense of the universe by classifying things. Nature exists in a continuum, not in discrete boxes. Nevertheless, we as humans need to classify things in order to bring order out of chaos. Having a definition of the word planet that expresses what we think a planet ought to be, is concordant with this desire to bring order out of chaos and understand the universe." And then there's the troublesome issue of "neighborhood clearance". As has been emphasized by many who reject the IAU's definition, planets like Earth do not satisfy this qualification since new small bodies are constantly injected into planet-crossing orbits – i..e near-Earth objects (NEOs). On top of that, this proposed definition seeks to resolve what is arguably one of the most regrettable aspects of the IAU's 2006 resolution. "The largest motivation for me personally is: every time I talk about this to the general public, the very next thing people talk about is 'Pluto is not a planet anymore'," said Runyon. "People's interest in a body seems tied to whether or not it has the name 'planet' labelled on it. I want to set straight in the mind of the public what a planet is. The IAU definition doesn't jive with my intuition and I find it doesn't jive with other people's intuition." Here, Runyon and his colleagues hope to present it as part of the Education and Public Engagement Event. It is his hope that through an oversized poster, which is a common education tool at Lunar and Planetary Science Conference, they can show how this new definition will facilitate the study of the solar system's many bodies in a way that is more intuitive and inclusive. "We have chosen to post this in a section of the conference dedicated to education," he said. "Specifically, I want to influence elementary school teachers, grades K-6, on the definitions that they can teach their students. This is not the first time someone has proposed a definition other than the one proposed by the IAU. But few people have talked about education. They talk among their peers and little progress is made. I wanted to post this in a section to reach teachers." Naturally, there are those who would raise concerns about how this definition could lead to too many planets. If intrinsic property of hydrostatic equilibrium is the only real qualifier, then large bodies like Ganymede, Europa, and the moon would also be considered planets. Given that this definition would result in a solar system with 110 "planets", one has to wonder if perhaps it is too inclusive. However, Runyon is not concerned by these numbers. "Fifty states is a lot to memorize, 88 constellations is a lot to memorize," he said. "How many stars are in the sky? Why do we need a memorable number? How does that play into the definition? If you understand the periodic table to be organized based on the number of protons, you don't need to memorize all the atomic elements. There's no logic to the IAU definition when they throw around the argument that there are too many planets in the solar system." "No. Because the assumption there is that the IAU has a corner on the market on what a definition is. We in the planetary science field don't need the IAU definition. The definition of words is based partly on how they are used. If [the geophysical definition] is the definition that people use and what teachers teach, it will become the de facto definition, regardless of how the IAU votes in Prague." Regardless of where people fall on the IAU's definition of planet (or the one proposed by Runyon and his colleagues) it is clear that the debate is far from over. Prior to 2006, there was no working definition of the term planet; and new astronomical bodies are being discovered all the time that put our notions of what constitutes a planet to the test. In the end, it is the process of discovery which drives classification schemes, and not the other way around. But seriously - who cares whether Pluto is a planet or not? It doesn't matter to scientists one bit. it doesn't change reality one bit. All it does is make it easier for kids to memorize the planet's names (a pointless excercise akin to learning states and capitals...as it serves no understanding or knowledge-purpose whatsoever. Teachers who waste children's time with such idiocy should be chastized). 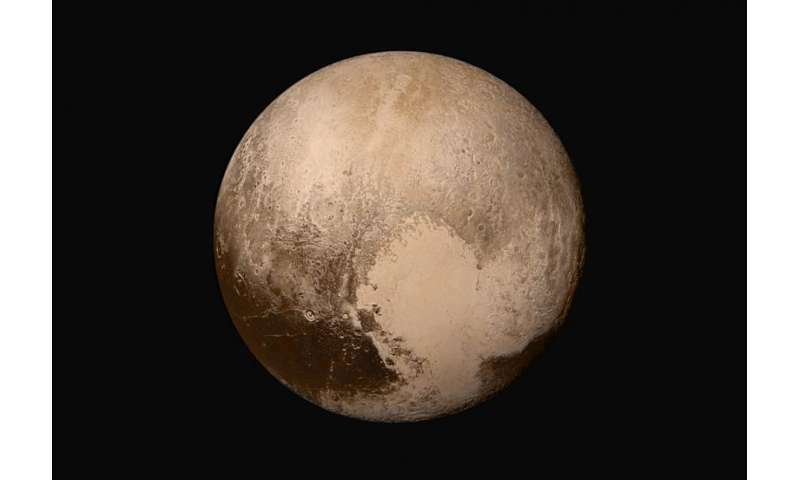 A person is not one bit smarter or dumber whether he knows if Pluto has the label 'planet' or not. What is the difference between planets, asteroids and comets? One to sit on, one to sit in and the other is an ejection seat. "It's not a planet if it orbits another, larger planet. It's a moon." which alas are two short of the 110. Best I could do. Enceladus, Hygeia, Mimas, Huya, Pallas. I disagree. Runyon admits that the meaning of any word depends greatly on its common use: Accordingly, "planet" cannot refer to any mere "substellar body", as this would reduce it to the same absurdity as agreeing that a star were no different than a "ball of hot gas". In common parlance, a planet is defined by the path of its origin: at a minimum, a substellar body which orbits or once orbited a star. This surely follows from current science as to planetary development and, so, includes all known planets, exoplanets and rogue planets. And planets must be large and massive sufficiently to attain a spheroidal shape; hence, neither comets nor asteroids, nor even smaller grained interstellar dust. Such discrete celestial bodies which orbit planets are not themselves planets, but moons, however sized or massive. A planet must "substantially clear" its own orbit of competing objects, lest it be indistinguishable from any large asteroid, TNO or KBO. The IAU has my vote!